or by phone at 434-665-1876. Tracy Meisenbach, Executive Director of ASHDA. Greetings horse lovers! I am Tracy Meisenbach, Executive Director of the American Sugarbush Harlequin Draft Association. This new organization was put together by me and several other like-minded people that wanted to preserve and breed forward the Sugarbush Harlequin Draft horse, as envisioned by Everett Smith. It is our goal to preserve the bloodlines he started and to expand the registry into a viable Association, with a show system, member benefits and public awareness. To this end we’ve come together, along with the lovely horses that make up the breed, and we formed an association for people interested in the American Sugarbush Harlequin Draft horse. I hope you’ll join us and experience the wonderful horse we represent, and the family atmosphere we promote. Sugarbush Harlequin Draft horses are sweet enough for the whole family! I am very proud to be the Executive Director and could not ask for a better group of board members to work with. A little about me, I’ve had horses all of my life, sharing my family’s strong equine background. I’ve tried to experience a broad spectrum of equine disciplines, and I’ve competed in everything from roping and dressage to polo and pole bending. I have shown in both breed and open shows and understand the differences between the two. I worked for several years as a veterinary technician while living in Texas and Arizona. With my family, I have a breeding farm in Virginia where we stand our American Sugarbush Harlequin draft and Appaloosa stallions and raise spotted babies. We also train and give riding lessons, including therapeutic riding. 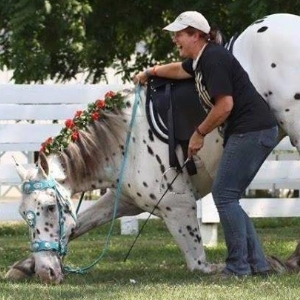 I have attended several equine expos using my horses as the Sugarbush Harlequin draft and Appaloosa representatives for the breed displays and explaining to the public what wonderful breeds they are. I am a former board of director for the Appaloosa Horse Club and had a very active role in bringing about much needed changes including an adult walk/trot program, stricter organizational guidelines and additions to the open show system. In 2005, I was awarded the ApHC President's Buckle for services to the Appaloosa Horse Club and its members. Prior to being on the ApHC BOD, I authored or co-authored such new programs as the Performance Permit, which started in 2007, as well as the Color Incentive Fund program that is the companion piece to the Performance Permit. The income from the Performance Permit added close to $100,000.00 to the ApHC coffers and helped to keep it financially viable. I retired from the ApHC BOD in 2014. During this time I also served on the BOD for the Colorado Rangerbred Horse Association, which also has strong ties to the American Sugarbush Harlequin Draft horse, due to related ancestry. My goals as Executive Director are to help this breed grow, both in numbers and public awareness. There are so many disciplines where this wonderful breed will excel. As competitors they are level headed and powerful, as companions they are gentle and trustworthy and as eye-catching and uniquely marked horses they have a high market value. The American Sugarbush Harlequin Draft is, like the country where it was born, full of opportunities.